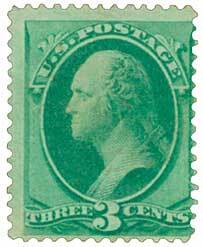 The 1870-71 3¢ stamp pictures George Washington. No other American has been honored more than George Washington. The Washington monument was erected in his honor in the nation’s capital, which was named for him. The state of Washington is the only state named after a President.